1. I'm thankful for airplanes and weather that cooperated. Both my sister and I arrived and departed on time. My sister flew in ahead of a snowstorm, and I missed a rainstorm at home. I overheard a woman in the airplane complaining that the airplane was so old, it did not have back-of-the-seat television screens. Inwardly I was thinking, "We are flying across the entire country in a matter of hours, and you are complaining because you will need to direct your attention to the screens hanging down in the aisles if you want to watch the in-flight entertainment?" 2. I'm thankful for rental cars. Not only did our rental car provide us transportation to and from the park every day, it also provided a lot of laughs. I asked my sister if she knew what the intermittent thunka thunka thunka coming from the back of the car was. She did, but it took us quite some time to figure out how to turn off the rear windshield wipers and stop the sound. (Did I mention that it was not raining?) The jerky transmission had us driving well below the speed limit, but that just meant we had more time to laugh together. I played the inept navigator (I won't mention how many times we ended up taking the exit into the Animal Kingdom parking lot, when all we really wanted was to drive to the rental condo), and my sister played the role of little-old-lady driver. Oscar nominations are soon, right? 3. I'm thankful for time shares and generous relatives. My sister's in-laws offered us the use of their time-share condo, which was conveniently-located and saved us a ton of money. We did have a slight problem one night remembering which unit was ours. I don't think we actually disturbed the residents of what-we-thought-was-our-unit when we attempted to unlock the door of their unit at 11:00 one night, though. We giggled and high-tailed it back to the car, where we looked at the registration paper and realized we were at the wrong building. 4. I'm thankful for good company. 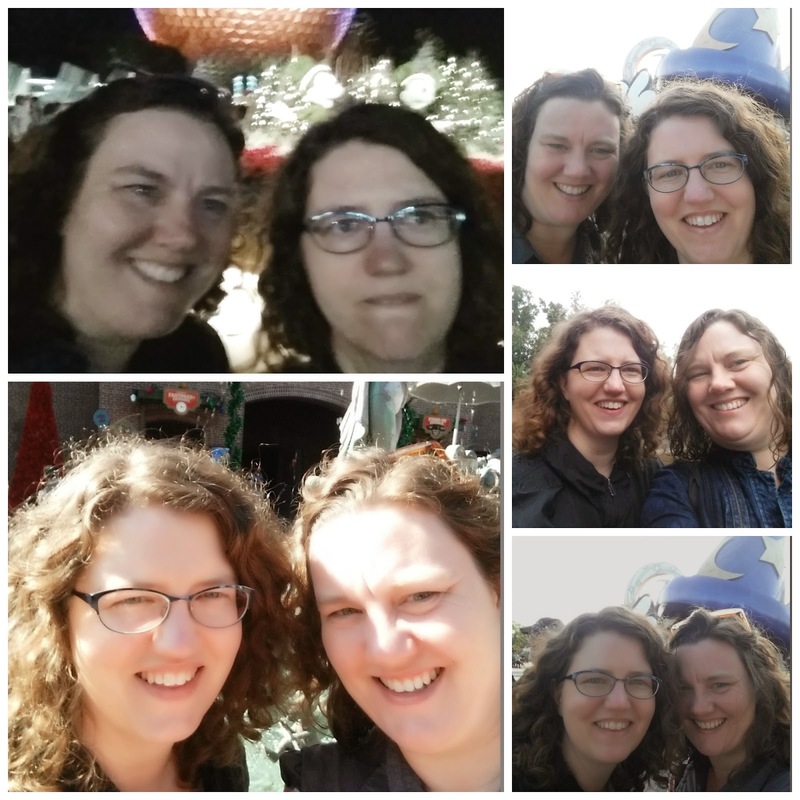 My sister and I had a blast together, and worked hard at perfecting the selfie to document our good time. I think we need more practice with photo-taking on some future vacation. We have fun down pat. 5. I'm thankful that my sister and I share the same tastes. Right before this photo was taken, we asked each other, "Why are we riding this ride? Neither of us care for large drops." We never did figure out how Splash Mountain made the list, but we survived, and even had fun--though you wouldn't guess that from the photographic evidence! 7. I'm thankful for the beautiful way Disney celebrates Christmas. We attended the Candlelight Processional on Wednesday night. 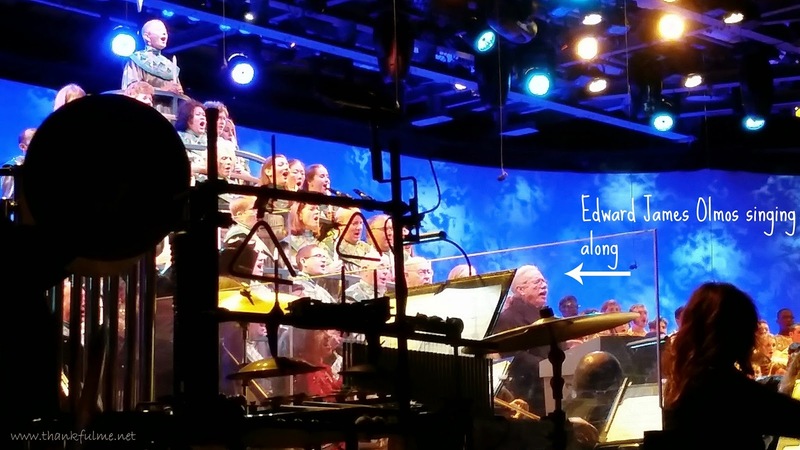 Edward James Olmos was the celebrity reader, and I was impressed that he not only read from Luke 2, he also sang along with the choir. The audience joined in on Silent Night, and we all rose to our feet for the Halleluiah Chorus. The Candlelight Processional is my favorite thing at Disneyland, and my favorite thing at Disney World, too. 8. I'm thankful for lights. What do you get when you combine thousands of lights, Christmas music, soapy "snow," and throngs of people? 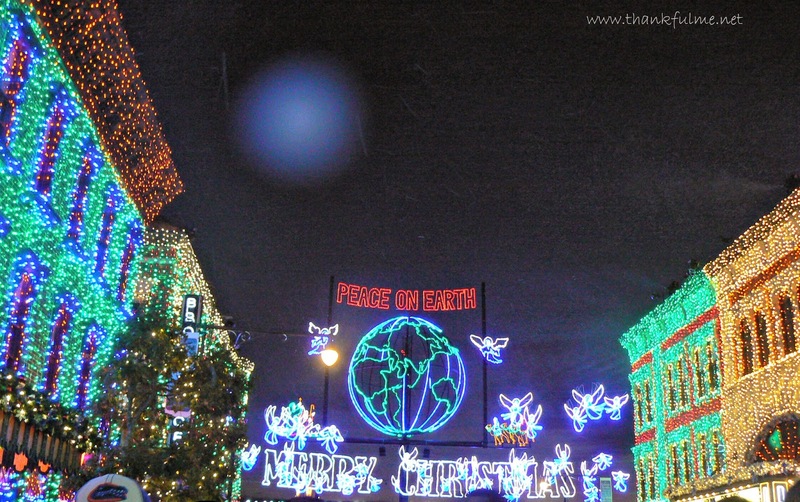 The Osborne Family Spectacle of Dancing Lights at Disney's Hollywood Studios. 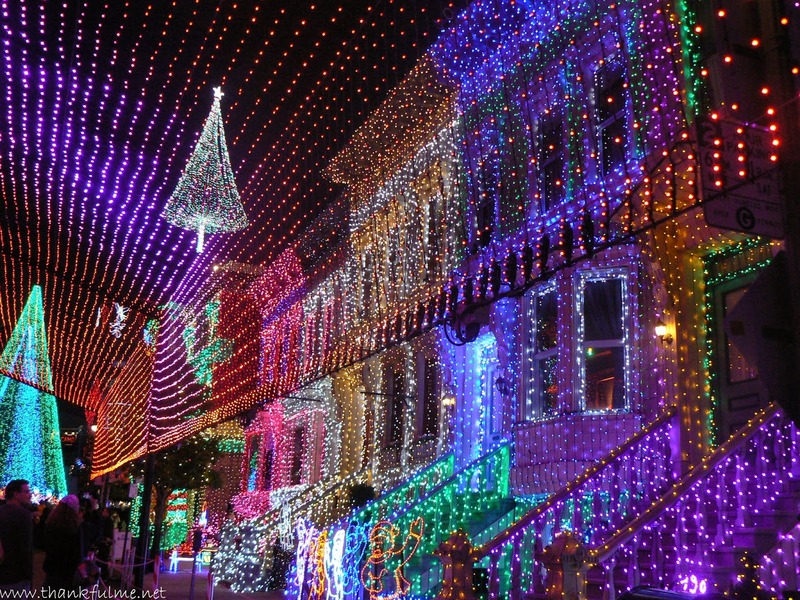 What an amazingly over-the-top display of Christmas lights! 9. I'm thankful for the humidity of Florida and the dryness of the desert at home. The humidity made my hands oh-so-soft. The desert is lacking the Florida-sized bugs. I managed to not see the local insects until the last night of our stay. Then I acted like a totally wimpy girl. The roaches scuttled away into the laundry closet, and my sister came up with a brilliant plan to make sure the bugs stayed away from our bedrooms. We're smart enough to realize our plan might have had some holes in it, but we convinced ourselves that we were safe for the night. I'm not sure what housekeeping will think. 10. As always, I'm thankful for John. He encouraged me to go and have fun, and held down the fort while I was gone. I had a terrific time there with my sister, but I also found myself thinking, "John would love this ride." When I told him that I had taken a photo of a white rhinoceros, he told me, "That's my patronus." Gotta love that guy! I have more thankfuls, but will stop for now. I hope the link is still live! I want to travel with the two of you! What a fun trip! The mistakes only make it that much better. Thanks for the story on the Osbornes. I could see how that display would stop traffic. Nope, not that condo. I don't want to name it because I don't want people to avoid it because of 2 roaches. It really was a wonderful, clean place; I think when in any humid, warm environment, there are going to be occasional bugs--I just prefer to blissfully imagine that if I can't see them, they aren't there. :-) Have fun in Orlando! Aww! How sweet is it that you two go to spend so much time together on a trip like this! The first time I went to Disney I was 16 and I thought maybe I wouldn't be as excited because I was older, but it was still fun and it looks like you ladies enjoyed it, too! Crazy what you mentioned about that passenger on the airplane. it goes to show how spoiled we can be with being able to have access to TV even on airplanes! I guess she wasn't willing to give that up in the way she's used to for just several hours! We had the best time! As for the woman on the airplane, her comment was definitely a 1st world problem comment. One thing about Disney. You have to go back. I haven't been since the kids were younger, but reading your post makes me want to get on a plane right now, The lights are beautiful. Such wonderful memories to share with your sister! I love that you had such a wonderful time with your sister. Having a friend or relative with whom you can eat your way through a park? Priceless. Trying all the "holiday" items would be a fun way to go! Edward James Olmos, huh? That's pretty awesome. Just loved him in Stand and Deliver and Selena. The bugs and roaches are what I hate the most about the southern part of the East coast. Call them Palmetto bugs all you want...still a roach. I am going to remember the door blockage trick if I ever have to go there again. How wonderful that you were able to spend a magical Disney time with your sister. I love that place! So happy for you that you were able to connect and have some one on one with someone dear to you. I'm glad that you had an amazing trip and adventure with your sister - precious memories! Thank you. We will remember this trip for a long, long time! Your trip sounds awesome and you and your sister look so much alike! What fun! And yeah, the bugs in FL are totally scary. Big time scary. Shudder. I love the light display! I'm such a sucker for holiday lights. 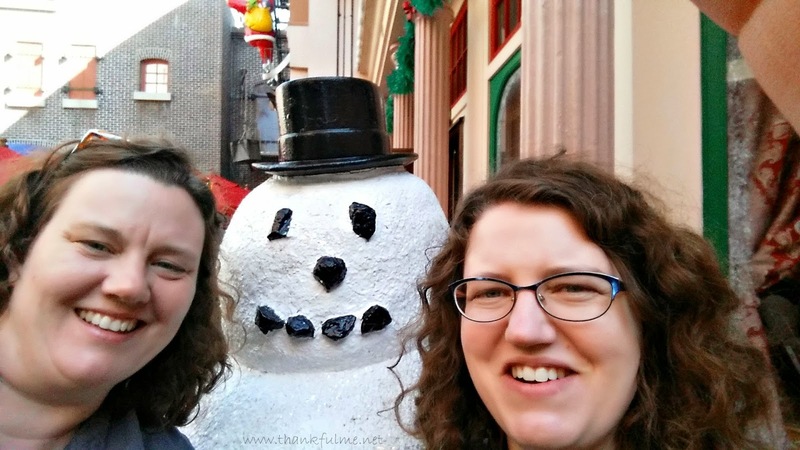 My husband's been teasing me because I keep putting more up... Great thankful list Kristi! The lights were absolutely amazing. Add in the music and the "snow," and it was a real Christmas sensory overload! 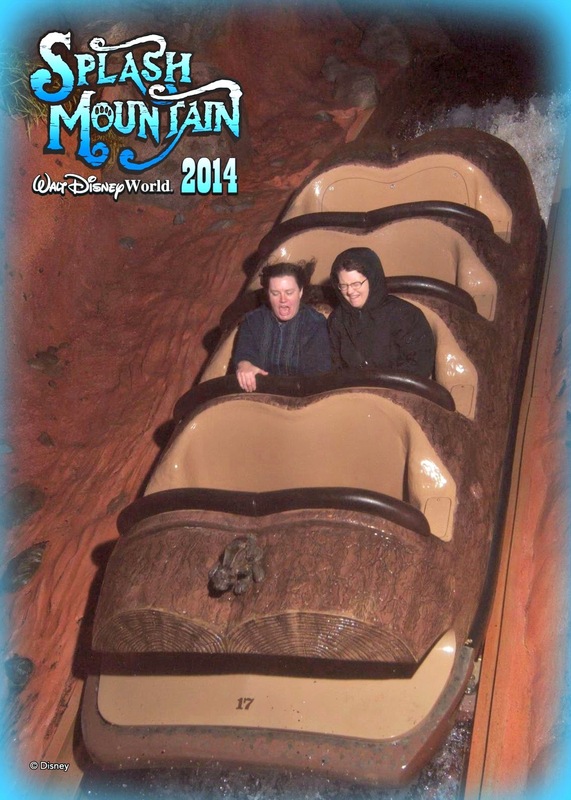 The Splash Mountain pic says it all:) You guys absolutely look like you were having the best time. I think it's special you can have so much fun with your sister. Sad the two of you live so far away from each other. 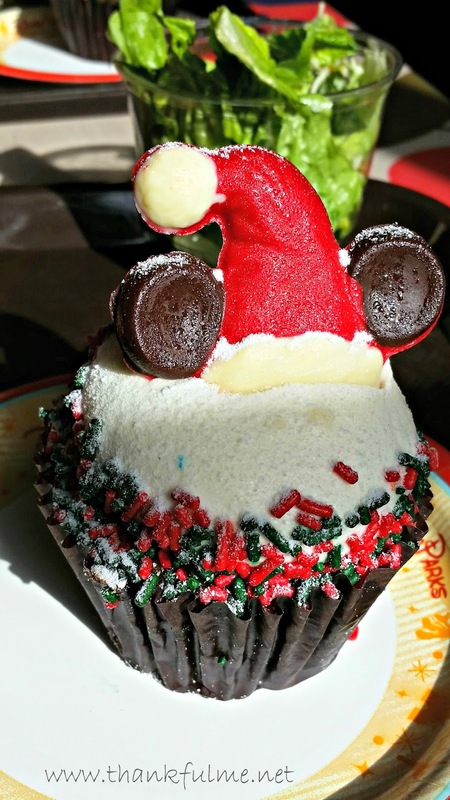 That cupcake looks so awesome and it's really got my sweet toothe aching about now! You have very generous in laws. That's very special. Thanks for sharing your trip! Your beautiful photos make me happy. I remember her asking if you wanted to build a snowman! So exciting! Glad everything cooperated. 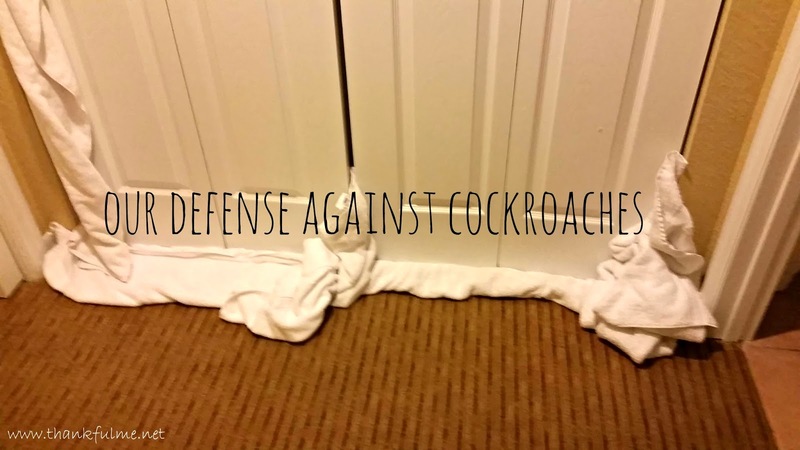 Even the cockroaches because truthfully they could squeeze under the towels. Sounds like you had a wonderful trip! I know how much you love Disneyland so this had to be a special adventure made even more special by having your sister with you! Love your pictures! It was fascinating to me to note the differences between the rides at Disneyland and Disney World. Very few were identical, even if they had the same names. This is the BEST post! You could have green screened one photo of you and your sister and plugged in different backgrounds, because, with the exception of the Splash Mountain picture, you look EXACTLY THE SAME in every picture! AND you look SO MUCH ALIKE! What an amazing trip! I giggled, picturing you trying to get inside the wrong condo and driving into the Animal Kingdom parking lot over and over (I did something similar with my cousin and a rental car and a missed exit in Cambridge, MA). The lights at Disney World are gorgeous. And there's NO WAY those roaches used their hairy, clingy legs to climb up those towels and come through the crack in the doors. NO WAY. I'm with you. There is NO WAY those roaches escaped. I was so sure of it, I didn't bother to check in the morning to see if they were still there. Trips with sisters are the best. There is this special kind of silly that comes out, don't you think? (or is that just us??) I have never been to Disney Land or Disney World, so don't know how to compare, but I'm sure my sisters and me would have fun too. Too bad it's so far away. We do have a Disney Land Paris, but it always seemed more child-oriented compared to the ones in the US. Don't know why, just a notion I have. Oh, there was definitely silly that came out! The story is that Walt Disney came up with the idea of Disneyland during a visit to a park with his children. He sat on a bench, and his children played on the playground. He wanted someplace where he and his children could play together. I haven't been to Disneyland Paris, but if it is like Disneyland here or Disney World, it caters to all ages. Sounds like such a wonderful trip. I can feel the love through the screen! Thanks for sharing the pics of the lights. Made me feel all Christmassy!